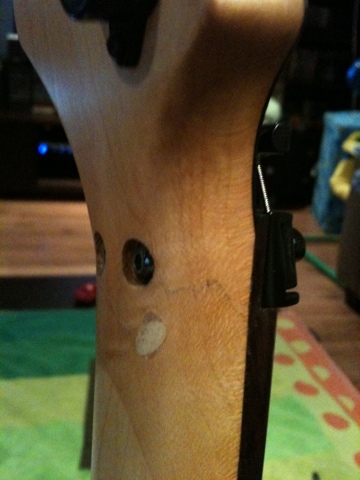 A couple of months back I posted about cracking the neck for the second time on my old faithful Ibanez RG470. I gave it to my Dad to try and repair, and he didn’t think there was much hope of saving it as quite a bit of wood had come out of the crack. 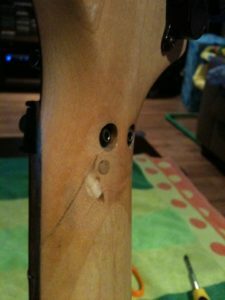 Regardless he gave the repair a go, but wasn’t sure if he had been able to get enough wood glue into the crack, and whether or not the extra dowel pieces he inserted would be enough to give this neck a third life. I got it back a couple of weeks ago, and as you can see from the pictures the back of the neck is looking pretty ugly, but the good thing is it all feels good. If you didn’t look at the neck you wouldn’t even know it had every been cracked. The real test was going to be if it could withstand the tension of a set of strings tuned up, and then actually being played, with whammy bar abuse and all. Well I’m pleased to say that after being strung up for a couple of weeks, I took my old faithful RG470 out for my band’s first gig, and it took everything I gave it, and didn’t miss a beat. It was a bit of a gamble taking it out, considering my Dad wasn’t entirely confident the neck would hold up. 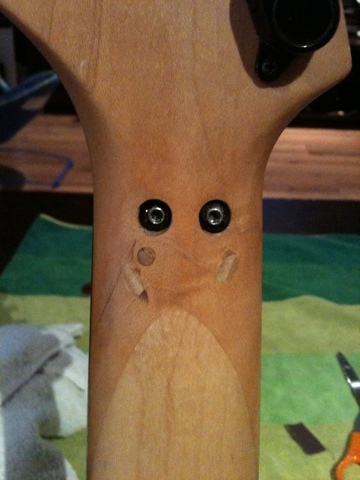 The guitar played perfectly though, held tune, just ate up everything I played, good and bad. I am so happy that I still have this guitar as part of my arsenal. It’s my first half-decent guitar, which I bought 16 years ago. Even though the frets are worn to hell, and the guitar has copped a hiding over the years, it feels like home, and I can continue to play the hell out of it. ... but it's lived to rock another day.